The latest version of the HSF questionnaire is ongoing – over 2200 participants and counting! Each year, we sort through the extensive volume of information to categorize and evaluate the results. Below is a brief synopsis of what we’ve discovered so far. 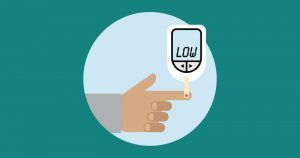 Sixty-four percent of confirmed hypoglycemics (diagnosed by a physician with a glucose tolerance test) indicated that one or more family members had been diagnosed with diabetes! With this information, we can alert hypoglycemics to the seriousness of this condition, as diabetes will almost certainly be the next stage if left untreated. It is also critical for diabetics to share this information with other family members as a preventative measure. Excerpt from Interview of Roberta Ruggiero by Wolfram Alderson, featuring background and results (2017) of the Hypoglycemia Questionnaire. You partnered with the Institute for Responsible Nutrition to conduct a national questionnaire on hypoglycemia. What have you learned? What insights have confirmed what you already knew, and what new understandings resulted from the questionnaire? Were there any surprises? We learned quite a few interesting things from our now >1500 respondents. First, about two-thirds of our respondents know they have experienced hypoglycemia, but only about half of respondents have been diagnosed by a physician and only about one-third have been diagnosed with an oral glucose tolerance test, the gold standard diagnostic tool. There’s a disconnect there—so many people know they experience it and yet they aren’t being diagnosed.